Having visited Rockingham before, I was in good spirits leading up to the race meeting. My main focus for the weekend was to go back to basics, and not to try too hard nor make silly mistakes (as I had at Silverstone and Anglesey!) I felt that would lessen the pressure I put on myself and get better results. For Friday testing, it was very much about getting re-acquainted with a track that I’d driven before. Rockingham is a track that I like a lot, unlike many who race there. I enjoy the technical, fun layout of the track; I know more technical circuits are more to my liking and I perform better. The first few sessions were spent trying to improve my times, however with the tyres I was using I was struggling to gain time. After a suggestion from Jack Sycamore from AB Motorsport to change to newer tyres, I went back out and immediately improved my time, going five tenths quicker. Knowing I had these quicker tyres, I didn’t want to use them up, and chose to switch back to the others to save them for qualifying the following day and for the races. I had an extra test session booked for the morning. Still on the slower tyres, I went out and actually improved my best time from Friday. The track was quicker that morning and had little more grip. Knowing this, I took it into qualifying, along with my grippier tyres, I knew I could achieve a quick time. I watched the first qualifying session go out. This gave me an idea of what time to push for. In no time, it was my turn to head out for the session. 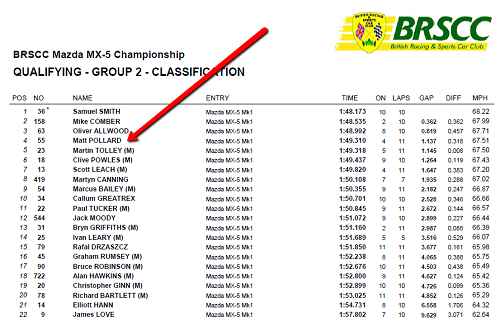 With Clive Powells and a few other fast drivers ahead, I chose to try and follow them for the first part of qualifying. After gaining a toe from Clive, I came around on my third lap and saw that I was fourth fastest in my group! As you can imagine, I was ecstatic with this but knew I could do more. I finished qualifying strongly in P4, my best qualifying yet… and I took the confidence I gained from qualifying into the races. My ambition for the weekend? To make it into all three A races. Previous Post: ANGLESEY…HERE COMES THE RAIN AGAIN! Next Post: SATURDAY AT ROCKINGHAM… ON THE FOURTH ROW OF THE GRID!